Play Golf at Graeagle Meadows Golf Course. One of four great golf courses in Graeagle. Rated in the top twenty Northern California courses it is well worth taking a few hours to play here. The Meadows is located just an hour drive from either Reno or Truckee. You take highway 89 north from Truckee or highway 395 north out of Reno to highway 70 then left through Portola to Graeagle. It is really a very easy day trip to play golf in the High Sierra. On a hot summer day we will be at least 10 degrees cooler than Reno. I often wonder how many golf balls float away down the Middle Fork of the Feather River. The River runs through the course, or the course surrounds the river. From The Meadows as it is commonly referred to, you can see many of the mountains surrounding the Mohawk valley. 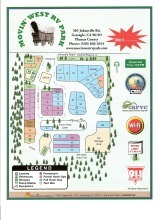 This course also has a four star rating on golflink.com when you are in the area you will want to play this course. The Meadows is a very open course for the most part. It is 6725 yards with a 71.2 rating and a 124 slope from the longest tees. The 6th is the course signature hole, a par 4, 386 yard hole. The pro tip on the Meadows website is to pull out the long driver and the camera. As you set up to tee off you will be looking at Eureka Peak a major local gold mine and museum that you can visit after you Play golf. At the end or the beginning of your day you can enjoy the restaurant. They make a great breakfast, and lunch isn’t bad either. Make The Meadows a part of you golf resort vacation. 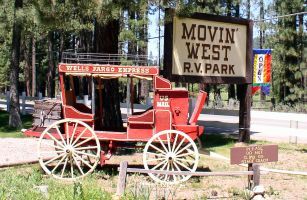 Whether staying with us at Movin’ West RV or at other accommodations in the area, make plans to play all of our local courses. We would love to hear your thoughts about playing the Meadow. What was your favorite hole on the course? Did you shoot your best round ever? Maybe you have a tip for playing your favorite green. Don't be bashful. Do you have a great story about The Meadows? Share your tips about how to play your favorite hole. Would you recommend others play golf here? Tell us what makes this YOUR favorite course to play. Enter Your Title Here. Example: Broke Par! Tell about the picture in your story. What hole, who is in the picture, Ect.